2013 CREW Benchmark: These wind turbines actively generate power 83% of the time and are available to generate 97.6% of the time. 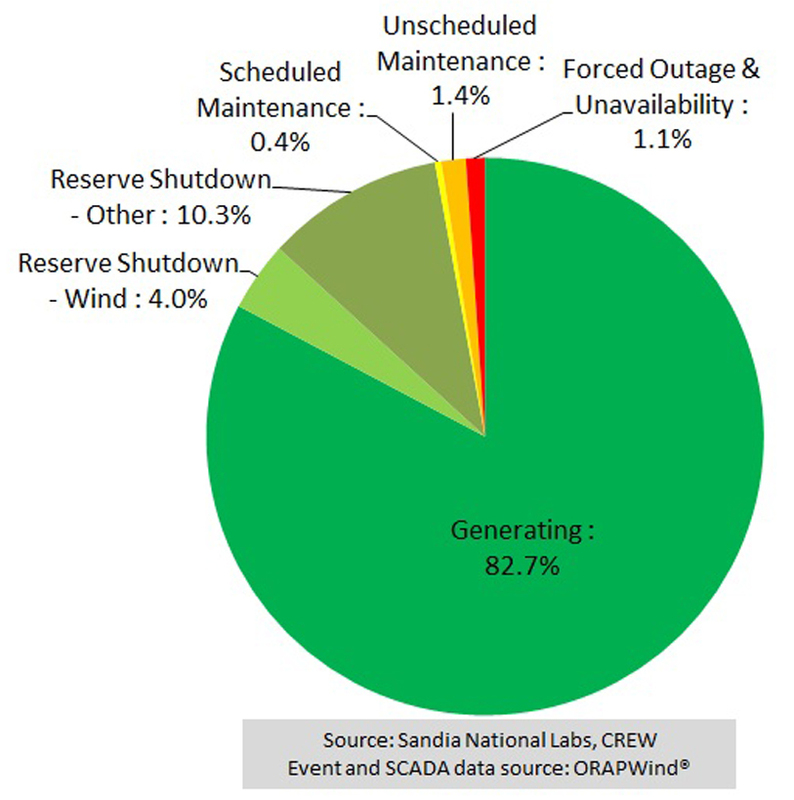 To characterize wind turbine and wind plant reliability performance issues and identify opportunities for improving reliability and availability performance within the wind industry, the Continuous Reliability Enhancements for Wind (CREW) Database and Analysis Program has been set up as Sandia. CREW information, based on analysis of industry partners’ proprietary data, is used by DOE to guide their understanding of wind industry performance and reliability, and to guide their R&D investment. The wind industry can also use CREW’s public benchmark to self-assess their performance against their peers. Additionally, the information can guide industry action to improve equipment performance, improve operating practices, and provide common expectations across the industry. Additionally, research engineers can use the data to further understand the field conditions the industry faces. Beyond providing industry with benchmarking information, CREW goals include further motivating the cultural shift to more effective monitoring, collection, analysis, and use of data as part of the CREW team’s “Full Data Picture” message. The Sandia project team also partners with industry experts to provide the public with other important research and knowledge. Recent examples include “CMMS in the Wind Industry” by Management Resources Group (MRG), “Wind Industry Work Order Information Flow Survey” by Muir Data Systems, and “Wind Industry Segments & CMMS Value Propositions” also by Muir Data Systems. The CREW Program also uses Sandia’s new and existing infrastructure for expanded analysis that characterizes reliability performance issues and identifies opportunities for improving reliability and availability performance within the wind industry. Examples of this work include further developing the industry’s understanding of turbine-to-turbine interaction and plant underperformance.